In 2008 on the island of Menorca in the Balerics, Oceancolors sucessfully organised the first Menorca freedive training camp. Last years event gave us six weeks of training, where atheletes came from eight different countries and went on to set ten national records. This year from the 1st to the 30th August 2009, by popular demand, Oceancolors will host a second training camp. It will be in the Azores, on the island of Faial which is set in this beautiful archipeligo in the middle of the Atlantic. The organisation will be the same principal as last year. The camp will restrict its numbers to only ten atheletes per day for optimum safety and use of the facilities. 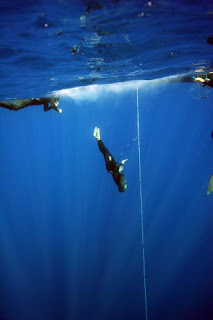 The camp will cater from elite freedivers to intermediate levels. This camp will enable top athletes who want to set a national record or prepare for the individual AIDA world championships in the Bahamas in November. 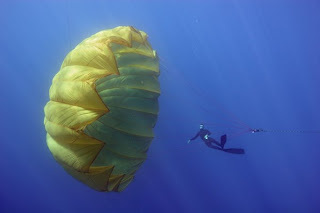 Intermediate freedivers will dive with them, learn their tricks and improve their deep diving. This camp will offer a fantastic framework. The temperate waters of the gulf stream are crystal clear and teeming with fish. The Azores are where the Atlantic species meet the tropical fish. There is a lot of large pellagic life and tuna, wahoo, mahi-mahi and sailfish are all common. The island of Faial is a nature reserve and we see many marine mammals sometimes directly in our training areas. Above the sea, the island is volcanic, it is very lush and green with little urban development. In the center there is an immense crater and to the far west a volcanic lunar landscape meets the sea. The locals are fantastic and really hospitable. Horta, the largest town on Faial is a center for fishing and boating, where you can find everything you need. It is a real escape from the stresses of modern life...there is no rush hour, no traffic jams or modern buildings.